Introducing EDEM high-fidelity load values into RecurDyn multibody dynamics simulations frees engineers from hand calculations and guesswork. Powerful generative design workflows support fully integrated topology optimization and Convergent Modeling for efficient design and simulation. Advanced solutions deliver on Simcenter’s strategy for structural dynamics, motion and acoustics, delivering superior functionality and performance. Improved industry workflows include universal connections support for efficient modeling of large assemblies. Simcenter 3D is an advanced standalone CAE application for analysts and discipline experts that works with data from any CAD source. 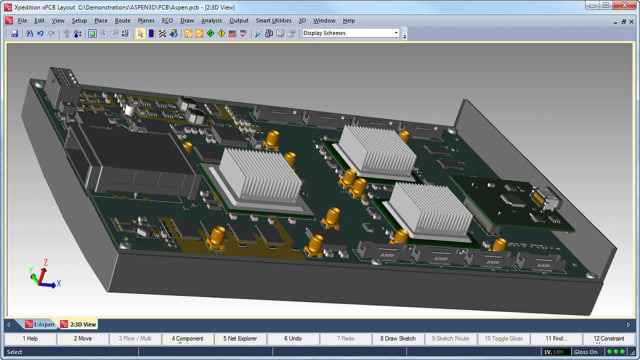 Being built on the Siemens NX platform, it of course works seamlessly with NX CAD. With more enhancements than any previous release, the newest Simcenter 3D—part of Siemens’s Simcenter portfolio of simulation and test solutions for predictive engineering analytics—looks to revolutionize how simulation engineers can help drive design direction in industries such as automotive, aerospace and industrial machinery. See our Predictive engineering analytics: Simcenter unifies, advances Siemens PLM’s simulation/test portfolio. The new release integrates significant capabilities that were previously available in legacy simulation tools such as LMS Virtual.Lab and Samtech Samcef. Integration and expansion of these capabilities into Simcenter 3D’s unified, scalable and open environment aims to help engineers, analysts and designers improve their overall productivity, and give their organizations access to a broad yet deep array of simulation technology. Parametric feature-based solid modeling is almost 30 years old. In that time, not much has changed. Sure, there have been plenty of CAD systems with their own take on how to model in 3D, but the basic principles remain the same: Create a sketch → Create a feature → Repeat. One of the main benefits of parametric modeling systems is being able to make changes quickly. Every sketch and every feature is driven by dimensions, so all you have to do to make a design change is to change the value of a dimension, right? Yes, in most cases, but if only it were that simple all of the time. When you create a sketch, you are capturing design intent by adding dimensions, constraints and references to other model geometry. This design intent helps you predict how your models will update when changes occur. However, if you’re not careful, you can easily get yourself into a pickle. Making too many careless references to other geometry in your model can make your model very fragile. If your model has dozens of features, you could end up chasing errors for hours. A lot of this heartache can be avoided if you have a basic understanding of what’s going on behind the scenes. Every geometric element created by a parametric modeling system has a unique internal ID number. This number is referenced by subsequent sketches, features, assembly mates, and drawings to work out where things should be placed relative to the rest of the model. So if that ID number no longer exists, guess what? That’s right, the feature doesn’t know what to do and fails. If a design change makes an edge or face disappear, it is likely that some downstream features will fail. It’s not the features themselves that are the problem, it’s the references you make between them. References can be your biggest ally, but also your biggest enemy.